You'll be £11.99 closer to your next £10.00 credit when you purchase ShipCraft 20: Scharnhorst and Gneisenau. What's this? Order within the next 9 hours, 6 minutes to get your order processed the next working day! The 'ShipCraft' series provides in-depth information about building and modifying model kits of famous warship types. Lavishly illustrated, each book takes the modeller through a brief history of the subject class, highlighting differences between sister-ships and changes in their appearance over their careers. This includes paint schemes and camouflage, featuring colour profiles and highly-detailed line drawings and scale plans. The modelling section reviews the strengths and weaknesses of available kits, lists commercial accessory sets for super-detailing of the ships, and provides hints on modifying and improving the basic kit. This is followed by an extensive photographic gallery of selected high-quality models in a variety of scales, and the book concludes with a section on research references – books, monographs, large-scale plans and relevant websites. The two German ships which form the subject of this volume were among the first products of rearmament under Hitler. For political reasons they were neither as large nor as well armed as foreign equivalents, but they were very fast, which led them to be described as 'battlecruisers' in some quarters. They enjoyed an adventurous war, both surviving heavy damage, before Scharnhorst was sunk in an epic gun battle off the North Cape, while Gneisenau succumbed to heavy air attack. 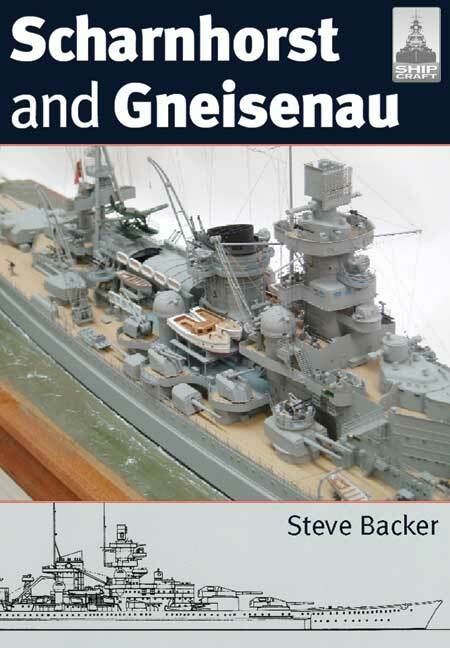 An excellent addition to a very interesting series, commended to modellers, wargamers, or anyone with an interest in the subject wanting brief information on different warships. Soundly researched, well-written and presenting good information, it is illustrated by superb plans and photographs and represents real value for money. Two of Germany's most famous special ships are the subject of the latest in the ShipCraft series for ship modellers. It looks at the histories of the vessels, both of which played significant roles during the invasion of Norway in 1940, and later embarrassed British forces by escaping from Brest and sailing through the English Channel to Germany. While Gneisenau remained in the Baltic thereafter, Scharnhorst continued to be a threat to Allied Arctic convoys until she was sunk in 1943 at the Battle of North Cape. For both vessels, the book gives details of modifications carried out, while a wealth of clear and detailed photographs and line drawings illustrate the ships themselves, as well as items of equipment. Around half of the 64 page book is devoted to modelling, with reviews of available kits, a gallery of photos of outstanding models, and superb colour illustrations showing different paint schemes. The modelling detail is supported by a design history of the ships and a look at their service careers, which ended with Gneisenau abandoned during a rebuilding and Scharnhorst sunk by the Royal Navy. There is enough of a general history of the ships for this book to be of interest to non-modellers, while someone aiming at producing an accurate model of either ship should find the book to be of great value. With this level of information the book aims to provide modellers with all they need to know to enable them to successfully build one of these famous warships. This book is part of a series that is aimed primarily at model makers and model engineers. The very high quality and drawings provide the detail needed by serious modellers. Available plastic kits are reviewed in detail, together with fine detail extra [arts available from specialist’s suppliers. Although the book is aimed at model making, it begins with an excellent concise history and background for German re-enactment in the 1930s. It also includes well-written histories for the two ships. As a result, this book will also appeal strongly to any naval history enthusiasts interested in this period of naval history. An excellent series and an excellent book within the series. Overall, the book offers expert advice on both the design/ history and modelling of these ships. It gives highly detailed information and it appeals to both historians and modellers. The author has done a splendid job with this book and it come highly commended. Once again the book follows the same format, providing archive images for reference, details of available kits and accessories and additional information that model makers may find useful when replicating these famous battlecruisers. If model ships are your thing you would do well to check out this series of books.